A Safe Start Block connotes a location in the part program where the program could be safely started because the programmer has provided at that point everything the program needs to know to execute correctly. You could cut and paste from a safe start block up to the next safe start block and you'd have a program segment that would run safely all by itself or as part of another part program. By convention, safe start blocks often begin with a toolchange. The Safety Charge Pump, often just called a Charge Pump, is a safety feature. It is basically a signal that the software sends to the hardware that acts as a “heartbeat.” So long as the heartbeat is there, the hardware knows that the CNC controller software is running, and the signals coming from it should be acted on. If the heartbeat disappears, it means the CNC controller software is no longer running, and any signals from the PC should be ignored as they are likely in error. S-Codes are responsible for controlling speed in part programs. Scraping is the preferred method of ensuring flatness with a very high degree of precision. It is a manual task and a somewhat difficult task to learn. The “bible” for information on scraping is a book called Machine Tool Reconditioning by Connelly. Any lathe that creates parts from continuously fed bar stock. Swiss Lathes are a particular type of screw machine, also called a Swiss-style Screw Machine. See Also Swiss Lathe. Some authorities require a screw machine to have multiple spindles, but definitions vary. The number of independent turns on a screw shaft; usually one, two, or four. These are operations done on a separate, usually simpler and cheaper machine, after the primary operations are completed. By using secondary operations, a manufacturing facility can do operations in parallel on a second machine and thereby achieve higher efficiency. A servo is a motor equipped with an encoder or other feedback device to create a closed loop system (See Also Closed Loop). They’re favored for CNC applications because they are more precise and have higher performance than steppers. They also have a much broader torque curve. To get some idea of how closed loop compares to open loop, you may want to visit my Stepper/Servo/Backlash Simulator Page. A servo fault occurs when the following error (See Also Following Error) becomes too great and the CNC control shuts down the machine until the operator can see what’s wrong. The following error may become too great due to a crash or simply because the machine was being operated at feeds and speeds that were beyond its capabilities. A parameter in a servo system that determines how rapidly the system responds to feedback (See Also Feedback). High servo gains makes for a very responsive system that has high performance, but it can also cause instability and susceptibility to noise. Servo systems require tuning, which is the process of setting various parameters so that they function smoothly and with a minimum of following error (See Also Following Error) and instability. The most important parameter is servo gain (See Also Servo Gain). One parameter system is called PID (See Also PID) for Position, Integral, and Differential. It is one of the simpler methods of parameterizing servo systems for tuning, but it is very effective. The expected value that a servo system is commanded to achieve, for example an axis position. A setup is a particular configuration of workpiece, workholding, and tooling. A set of machining operations on the workpiece without the need to remove it from the workholding system is considered a single setup. Setups generally take time and involve precision measurement and alignment, so being able to perform a lot of operations on a single setup is advantageous for productivity. Shielded cable typically has foil or a braided covering surrounding the conductors. The foil or covering is then grounded to prevent electrical noise from entering or leaving the cable. It is a good practice to use shielded cable with CNC machinery to help control electrical noise and ensure reliable operation. See also Noise. A mode triggered from the operator panel wherein the program executes one block each time the Cycle Start command is issued. This makes it easier to try out the program a single step at a time and see what it does. Single shot oiling is a feature on machine tools whereby a series of passages and plumbing supply lubricant to all the key points on the machine from a single source. That source may be a manual or automatic pump. Use of single shot oiling is much more convenient for the operator and assures consistent lubrication to the machine for best performance and longest life. - Prismatic Ways : These are prism shaped ways common to lathes. - Linear Ways : Linear ways use linear slides as rails and so are much different than the other three styles. The roll on ball bearings as opposed to having more metal-to-metal contact in the other designs. Linear ways will have the least rigidity, but for the price, they are ideal for precision and high speeds. Milling a channel in the surface of a workpiece. For best accuracy and surface finish, a cutter narrower than the slot width can be used. Cut the middle of the slot first, and then cut each edge so that the final finish does not require the cutter to machine on both sides at once. 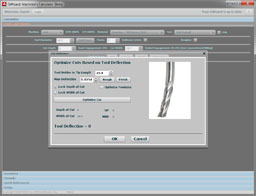 The ability of the CNC control software to set limits on axis travel in the software. Once set, the software should never command the axis to move beyond the limits. A solid model refers to the abstract model a 3D CAD program creates, or to the data in the file from such a program. A solid model represents a 3D object. A solid state relay is just what it sounds like—a relay with no moving parts. See Also Relay. Solid State relays are designed to handle either AC or DC current, but you must make sure you have a relay designed for whichever type you’re handling. Solidworks is an extremely popular CAD program often used for CNC applications. Some say it is the most popular software used by CNC professionals. The spindle of a machine is the part that rotate either the workpiece or the cutter at high speed for machining. Similar to Feed Override, Spindle Override lets the operator manually change the spindle speed to increase or decrease it by a percentage of the programmed speed for fine tuning purposes. Usually refers to a lathe spindle, although one could also be installed on a mill. These sensors are used to measure the speed and sometimes the position of the spindle. It is particularly important to understand spindle speed when threading. In that case, the sensor is telling the control program, such as Mach 3, how to keep the two axes synchronized to produce the thread. A variety of sensor types may be used including optical encoders, optical sensors that work by reflectance or interruption of beam, and Hall Effect proximity sensors. A spindle speeder or spindle increaser is an attachment for a milling machine that contains a gearbox that multiplies the speed of the spindle. This makes it possible to achieve the smaller speeds needed for smaller cutters, engraving cutters, and jig grinding. A bed mill with a square column equipped with a dovetail way to support the head in the z-axis. When starting to machine stock, it is often advantageous to begin by squaring the workpiece. This is a process of machining all edges of a rectangular block until they are flat and square. Doing so ensures future machine work will be more accurate because the sides of the block will index properly in the vise or other workholding device. The same can be accomplished for a lathe by taking a light facing and turning cut to ensure a true cylinder aligned with the axis of spindle rotation. Squaring is the process of ensuring that the axes of a mill are at right angles to one another. This is accomplished by shimming, machining, or otherwise adjusting the mating surfaces. ISO-10303 STEP Product Data files. STEP stands for the Standard for the Exchange of Product Model Data. STEP is a standardized CAD file format using XML that is relatively new and still evolving. STEP Tools has quite a bit of information on STEP at their web site. Step and Direction are a type of controller protocol favored for use with stepper motors although there are servo drivers from companies like Gecko that also accept step and direction inputs. Mach3 and other machine control software often emit step and direction signals over a parallel port or other communication medium. A step is a unit of motion for a stepper motor. The step-over is the amount of a cutter’s diameter that is engaged in a cut. Typically, the step-over should be 75-80% of the cutter’s diameter or less. Step over can be a value to keep in mind during manual operation, or a parameter used by a CAM program to generate an appropriate part program that will use the specified amount of step over. See also CAM. A stepper is a motor that moves in discrete steps. Typical motors have 200 steps per revolution, but many other specifications are available. See Also Hybrid Stepper, Bipolar, and Unipolar. Steppers are less expensive than servos, but are generally less desirable for high performance applications because they are usually operated as open loop systems. See Also Open Loop. To get some idea of how closed loop compares to open loop, you may want to visit my Stepper/Servo/Backlash Simulator Page. Stick slip is a phenomenon due to the fact that friction between two moving objects is lower than between two stationary objects. The force required to make the two objects is great enough that the objects will suddenly slip uncontrollably when they start to move. This is a property that machine tool designers must deal with because CNC machines start and stop frequently and expect to do so over very short distances and with great precision. One of the chief steps taken to combat stick slip has been the use of PTFE on the ways. PTFE has nearly identical coefficients of static (fixed) and dynamic (moving) friction. See also PTFE and Acetal. STL is an abbreviation for "stereolithography language". It is a file format commonly used by CAD/CAM programs to represent 3D models. 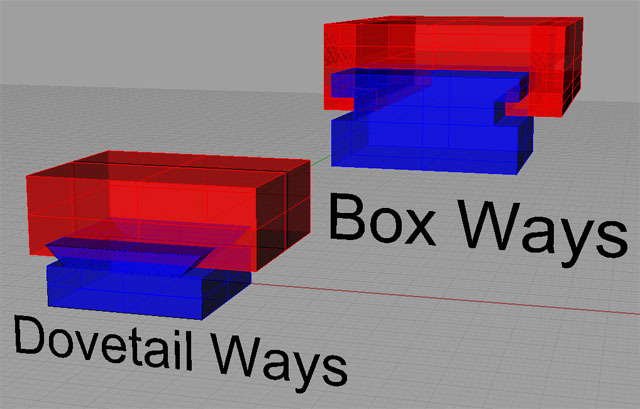 STL models consist exclusively of triangulated meshes, so such files may not be the most desirable form for a model as they lose information such as the original smooth curve or NURB (See Also "NURB") that was used to create the object. A technique used in 5-axis milling where a ballnose cutter is operated at an angle other than vertical to the surface to that the dead spot on the end of the endmill that's hardly moving is not used. If you look at a ballnose cutter, the effective cutting speed reduces the closer you get to the tip until it is theoretically zero right on the tip. It is possible to utilize Sturz milling without a 5-axis machine so long as the orientation of the workpiece is such that the dead tip of the cutter is not engaged in the workpiece.. Surface speed, sometimes called Cutting Speed, is a measure of how fast the tool is moving over the work as it cuts. It is measured in SFM or Surface Feet Per Minute. Ideal surface speeds vary by material and are categorized in Machinery’s Handbook. Some typical values (look up the correct ones, these are for illustration!) might be 500 for plastic, 300 for aluminum, 200 for brass, 100 for mild steel, and 50 for stainless steel. A lathe whereby the work is fed through the spindle to provide Z-axis motion--the tooling does not move in Z. Most lathes keep the workpiece fixed and only the tool moves in relation to the rotating workpiece. Swiss lathes excel at creating complex small cylindrical parts. Swiss lathes may also have multiple spindles. They are a type of screw machine.